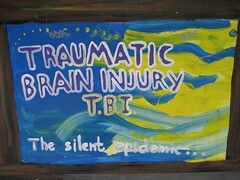 Artistic and creative talent frequently emerges with brain injuries and other illnesses and traumatic events. By discovering creative abilities one helps with increasing their awareness of self and others. Self-awareness helps one cope with traumatic (mental and physical) experiences and symptoms, decreases stress, and promotes pleasurable experiences of life through artwork and other creative projects. There are many forms of artwork. To mention the most common forms of art: freelance art, drawing, painting, and coloring. Dance is also a form of art. Art is physical or mental, or a combination of both. Often after severe injuries art helps make sense of the world and surroundings especially when the former-self and new-self are very separate. New & former self is not a matter of acceptance, it’s a matter of how the brain is damaged and repairs. One believes indicating that one needs to “accept” what has happened and “move-on” is ignorant and negates the fact that most are trying to do such. Damaged brains don’t work like healthy brains! Some brains heal and others don’t, and no one has the answers why! For that matter, some brains heal in areas not expected to heal. Do we really know if the brain heals or another area took over the functions that were lost in the damaged area? The only evidence we are positive of the healing process is by imaging segments of the brain. This doesn’t identify microscopic healing which occurs in brains. Neurological exams (only when they are truly objective) can help identify microscopic healing by the way the body functions. Is it more important to have a good looking brain or a good functioning brain? That’s a NO brainer! Yeah right, who really cares what their brain looks like? It’s all a matter of perspective. If the brain works well, no one questions what it looks like hence there will be no imaging available to those individuals. There shouldn’t be. Why have tests without reason? There are clinical studies that will include candidates without symptoms versus those with symptoms to help with research, knowledge and treatment. Those are far and few between given the complexity of the brain and a population in the world greater then 7 billion. Majority of people with TBI, injuries, and illnesses have moved-on, but no one can totally separate a former-self from the new-self. If this happens it becomes a significant mental illness. Moving-on is personal and is hardly measurable by another’s perception of what is right and what is wrong! It’s like leaving all your memories behind and not understanding why you are the person you are today. It’s the sum all your life experiences that make you the person you are today. Most people become stronger by experiences whether they are positive or negative. The way the brain heals is not controllable, but it can be helped to heal by exercise, nutrition and sleep. In addition, hobbies such as: reading, coloring, writing, and puzzles to name a few help aid in healing. These all enhance cognitive function, and by this promotes new pathways in the brain. Is it our Emotions? Memory? Personality? Sleep? Nutrition? Exercise? Cognition? Spirituality? Genetics? Physiological changes? Psychological changes? Education? Relationships? Experience? Age? Cultural? Environment? Financial? Housing? Prejudices? Independence? Dependence? Available resources? Insurance? Political? Is it a combination of all these factors that increase awareness of how one has changed and what one has lost? Unless it is total amnesia (which is rare), it’s impossible to change every learned variable and become a totally “new person.” Who wants to drop their former self anyway? Imagine eradicating all your life experiences before injury and illness? Certainly not something the majority of us would choose to do. Yet, lacking scientific cures this is suggestive to “move-on” and “accept”. “Moving-on” is important as long as the “former and new self” become one or the “former self” and “new self” are aware of differences and struggles within. Acceptance and moving-on are very different. Acceptance is forced upon one with TBI, spinal cord injury, chronic illness and other problems. There are no alternatives. Every day is unpredictable. Is “acceptance” a misunderstood concept? Is “acceptance” an idea that happens internally or externally? To be a survivor one has already “accepted” injury or illness, hence one will not survive. Is acceptance internal or external? You can’t survive without accepting. There are different levels of acceptance, but the term is used generically. Since this term is used loosely, it’s like placing blame and faulting the survivor for things beyond their control. What’s wrong with healthcare providers “accepting” responsibility that complex injuries and illnesses are the least understood and need further research to help survivors and families live their optimal level of functioning. Should the focus for “acceptance” shift from the patient/survivor to relatives, friends, acquaintances, and colleagues? How have you felt after struggling so hard as survivor or caregiver when the proper educational tools are not provided and you must search for answers on your own? How have you depended on the internet for answers to medical questions and educational materials?